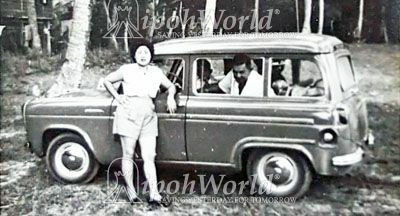 According to our donor, Charlie Choong, the first picture (which shows his mother leaning against a Ford) was taken at Telok Muruh, Lumut where his family had a beach house. The second picture is of the beach house; note the Ford parked at the foot of the hill. Incidentally, this property was also partly owned by Sybil Kathigasu. 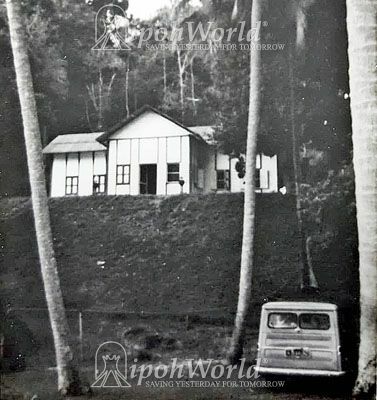 However, the property was taken over by the government in the 1960s for the establishment of the Lumut Naval Base. The third and fourth pictures show the front and back of the deeds. The last two pictures show the Base, viewed from the sea. Charlie also mentions that "the location where the beach house was is now a stadium and housing/flats for the Naval Base. It is a restricted area! 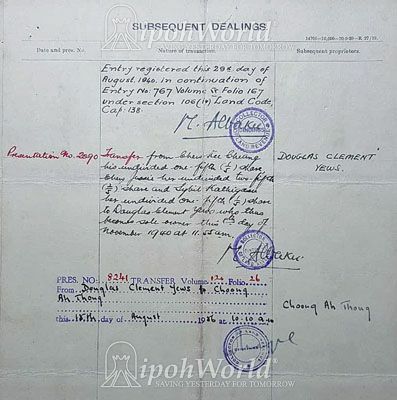 The Ipoh Swimming Club used to organise sports matches with the Base; once the games were over they would proceed to the duty free shops!" We thank Charlie for the pictures and the information.